Head Light Rubber Gasket, Lucas. Lucas replacement headlight rubber gasket. Each. Side Pipe Gaskets. Mounting holes are 4 1/4 center to center. Set of 2. Windshield bottom rubber gasket comes with enough material for one windshield. 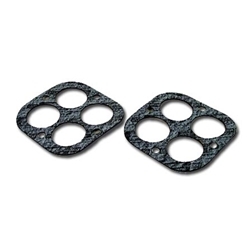 Windshield surround rubber gasket comes with enough material to complete one windshield. Hardware and gasket for the Finish Line Gas Cap Assembly. Tail Light Gasket for Lucas 542 tail lights. Fits original 289's and early 427's. Also fits replica's and continuations.